EnviroMax engineered enclosures are designed to meet science and industry's increasing demand for automated processes and quality control containment. 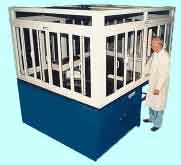 The enclosures feature a flexible, modular design and are engineered and built to exact customer requirements. They contain and control automated processes while maintaining a safe work environment. Systems can be engineered to maintain either vented exhaust air, HEPA filtered supply air, or temperature controlled recirculated air. Sliding door accessibility can be from any side and a variety of accessories including support tables, work surfaces, lighting, electrical, plumbing and glove ports are available. HEMCO Corporation, 111 Powell Rd., Independence, MO 64056. Tel: 816-796-2900; Fax: 816-796-3333.